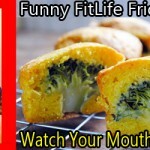 – December 24, 2018Posted in: SusieQ FitLife, SusieQ FitLife Breaking News, SusieQ FitLife Updates! 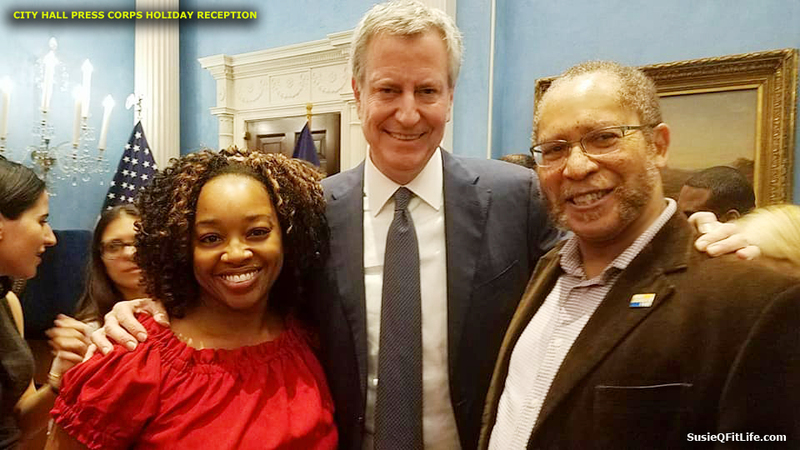 We were at the City Hall Press Corps Holiday Reception Party around this time last year while I was secretly pregnant with my second baby and my husband Michael Benjamin had no clue! Yes, he is the father but, how was I going to tell him that we would be welcoming a new baby when we believed we were only going to have our only child, Maxwell? As women we tend to speak with our girlfriends, our mothers or another mother and sometimes even a complete stranger as a sounding board before we let the father of the child know what’s going down! Unfortunately, my mother passed away shortly after Michael and I got married in September, 2014 and she never met her grandsons which she longed to have according to her closest friends. Shortly afterwards, I lost my younger sister in the summer of 2016. We just suffered the loss of Michael’s father just a month prior to learning about our new Benjamin baby, just days before the Gracie Mansion event. 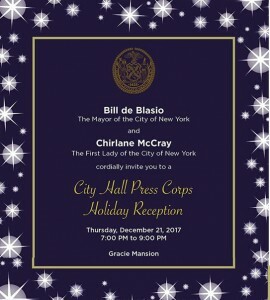 The timing was just right speaking with First Lady, Chirlane McCray letting her know about the little bun in the oven as; Michael spoke with her husband Mayor, Bill de Blasio. We just spoke about the best ways to announce a pregnancy to an unsuspecting husband some life changing news in a fun creative way. Surprisingly. Chirlane suggested making the announcement during some quiet down time at home. Very low key. 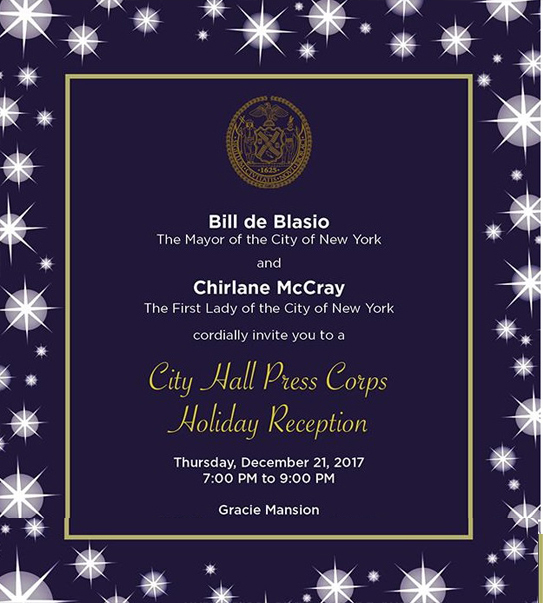 Hmm… I was not going to grab the microphone from de Blasio’s hand to make any public announcements during the holiday party of course not! Typically, expectant parents wait to “go public” around 12 weeks to avoid possible risk of a miscarriage or waiting for the first trimester tests to ensure the baby is okay! Being at the event was so entertaining and Michael is so lively doing what he does best in a politically charged room! He knows everyone and everyone knows him too! He’s such an amazing Dadda! It’s not too often that my mother & brother-in-law get to watch Maxwell for us so we can go out and have some fun. It was so enjoyable speaking with the First Lady along with a Latina Journalist who was so excited about our news! 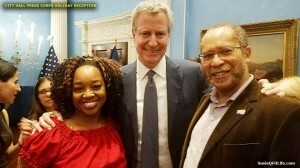 Just after Michael and I captured a quick picture with Chirlane (moments before sharing my news with her), she graciously wished us the best of luck with! The truth is that women are experiencing a wide range of hormones, feeling mixed emotions about the huge moment, naturally confiding to another woman for advice; whether the baby was an expected “love child” or a surprise “oops baby” creating more shock! My memory has always been hearing about (young) women speaking about these situations whether in high school, at the workplace or at church long before the father-to-be even learns of the news and that is if they even learn anything at all! Men don’t always have to be the last to know if they are holding the at home pregnancy kit or if they are planning a pregnancy with their significant other! Happy Holidays & celebrate with good friends and family.